I’ve been using the new 2.66 GHz Quad Core Mac Pro (That’s two Intel Xeon server spec’ed processors each with two processors sharing one die) for a week now: Wow! My impression may have a lot to do with two factors: The other ‘new’ computers I’ve come in contact with recently were G4 based PowerBooks. The G4 was a processor that was long outdated before Apple switched to Intel based processors and mobile machines, though convenient, are never as powerful as desktops and servers. The other factor might have been my previous work desktop machine was a dual G4 450GHz that was manufactured around 2000/2001. I’ve been struggling to try to use this new beast to its full potential, but it’s not easy. The hardest I’ve worked it so far was only 87% of its CPU(s) power – and that was transcoding two videos at once. (Oh and don’t expect any interesting video from me shortly, I was transcoding video only for the sake of trying to use 100% of my CPUs). I imagine I can’t actually use all of the CPU power in this machine unless I get more RAM and a faster hard drive, but I barley need this amount of power as it is. My experience has been that four incredibly powerful cores means that Mail.app and iTunes still take about 4 seconds to launch, but they always take 4 seconds, even if you are transcoding video at at the same time. The last thing I have to say about the Power Mac is that it is just a brilliant piece of industrial design. The expandability and layout of the internal structure is genius, and again, the power! I’m sure that if I work for Brock for 5 more years this machine would be an ideal platform throughout.Â Information week just named it the best Windows desktop out there. Sensus data suggests that Britainâ€™s fourth- largest religion is Jedi.Â Based on this two Star Wars fan asked the United Nations to recognize JEDI as an official religion. All I can say to these guys is, Yo’da man (men)! Could you please add more checks for Java and popups? The 3 or 4 that I need to wait for when I log in really aren’t enough. And adding another Java/popup check every time I post to a discussion group still doesn’t do it for me. How do you know with so “few” checks that a user’s browser environment is really ready for the awesome capabilities of WebCT version 6 if you don’t check for Java and popup capabilities at least once every 30 seconds? In fact, checking every 15 seconds might even be better, because who knows how often these clever new browsers could change their capabilities, or be modified by users? A Surreal experience:Â I was watching the CBC news at six in Toronto and was curious about their blogs and such. I almost always have my laptop with me as I watch the news and I went over to CBC.ca/toronto and clicked on the news at six link, and there was my father half way down the page! 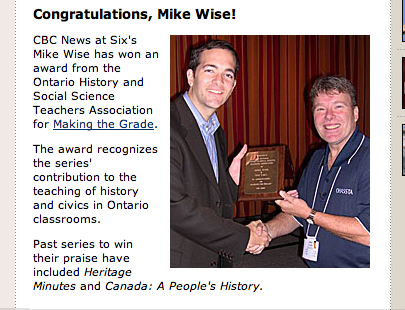 So congratulations Mike Wise for your award from OHSSTA and congratulations Mike Clare for making it to the CBC web site. HawkWings.net has a good write-up on MacInTouch reader Bill Benson’s rule for fighting image based spam. Basically, most of this image spam contains a heading Content-Type which contains multipart/related. You have to add the header to your rules in Mail.app, but that’s the only tough part. I would recommend you set the filter to change the background colour until you know everything is working. Update: You may want to add something like “From” does not contain [email protected]. You are currently browsing the iMatt :: The Blog of Matt Clare weblog archives for November, 2006 .